I love the North end, and I really love being an engagement photographer. I am lucky enough to have family in the area, so I know it well. 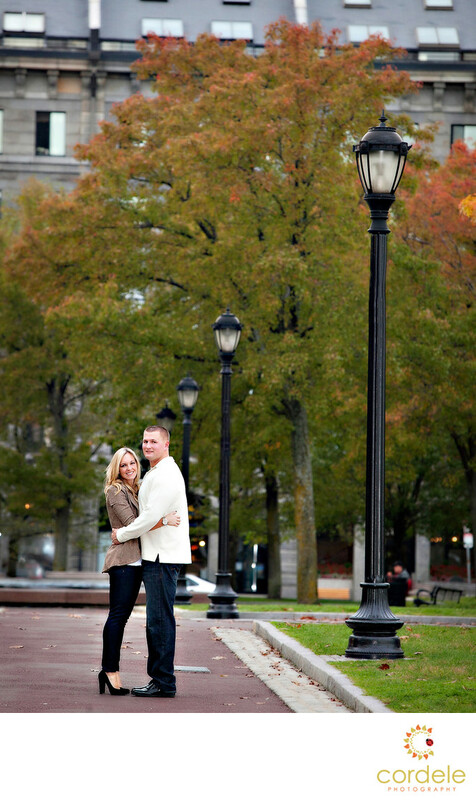 This is a photo of a couple posing on the walkway of Christopher Columbus Park in Boston. One of their engagement photos is one of my most pinned photos ever (I think its up over 1200 times to be repined. It was a crisp fall day when we did this shoot. Mandy wanted to get the waterfront of Boston but wasn't sure where to go. I suggested we start in the North End and walk around. She was up for anything even if it meant walking in her 4 inch heals on cobblestones. She had two outfit changes which made the shoot work so well. She had a pretty fancy dress and he wore a button down shirt, and then they changed into these casual outfits. We were able to photograph both casual and formal and it really brought the shoot to life!